Richemont Group Launches new watch brand, Baume, conceived of under the Baume & Mercier umbrella. Yes, you heard right. 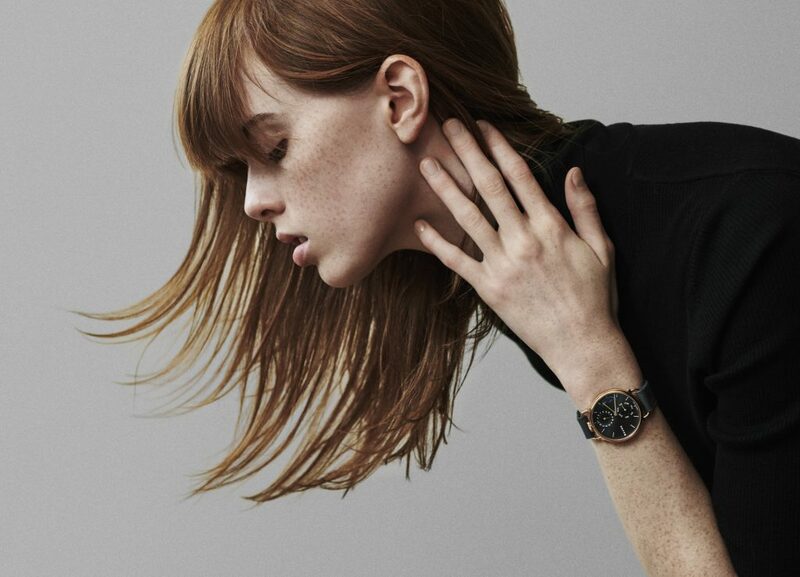 The luxury Richemont Group has just launched a new watch brand — an affordable one at that. 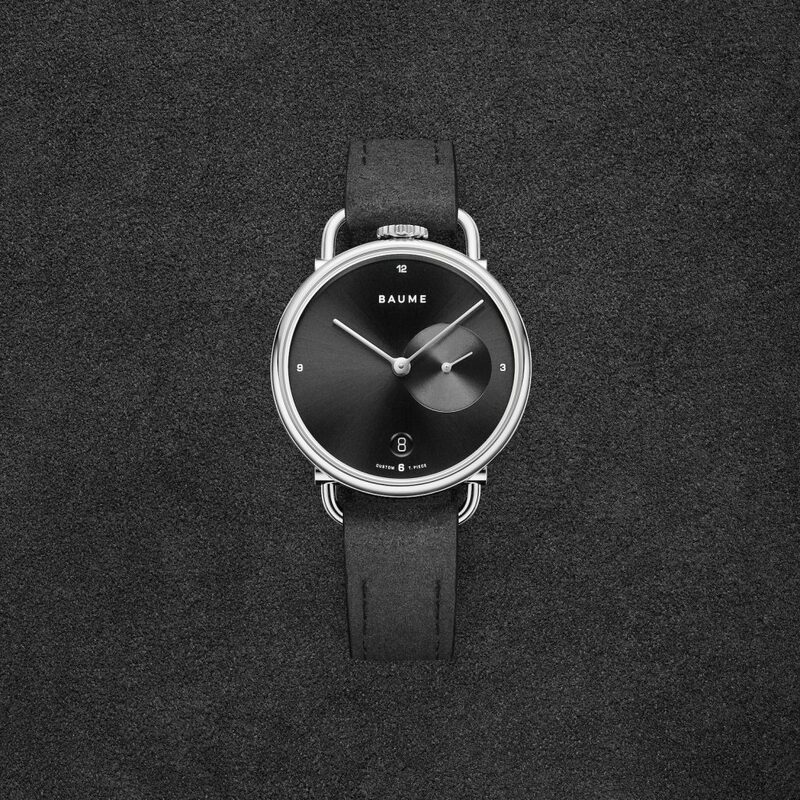 Yes, you also heard right, the new brand is called Baume — mostly because it was conceived of and begun under the auspices of its “mother” brand Baume & Mercier. Additionally, the new brand — which now has its own design team and leader, veteran Richemont Group product director Marie Chassot — is geared for a better future and is created using sustainable, up-cycled and recycled materials. 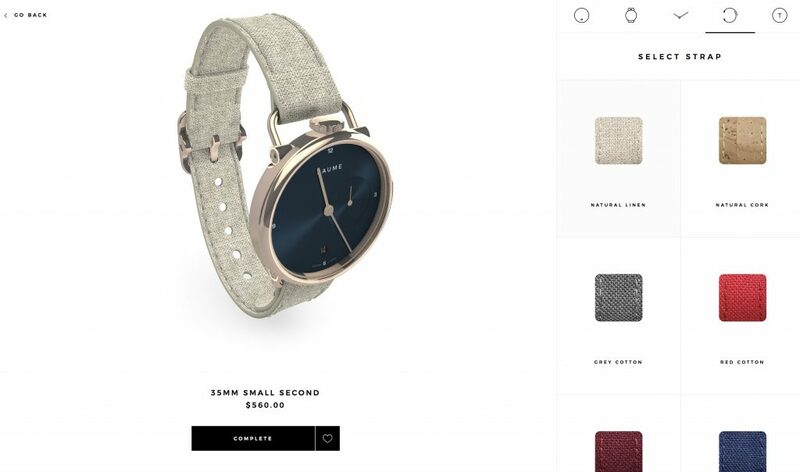 In addition to the Iconic line, the new brand will also offer a completely customizable watch via an on-line configurator — with retail prices starting at about $560. So, with so much news here it is important to dissect this story fully, but the most important thing to take note of here is that a luxury watch group — the Richemont Group — has unveiled a $600 average-price-range all-new watch brand … and calls it Baume. Keep these points in mind as we explore this story. The new Baume brand is considered genderless and utilizes only sustainable, recycled and up-cycled materials. Essentially, the new Baume watch brand was born on the idea of a “better tomorrow.” The “genderless” brand has several quirky and important aspects to it. To begin with, the watches — offered in 35mm or 41mm size — are totally sustainable with case materials such as aluminium, stainless steel and PVD steel, and straps made from natural materials like cotton, cork, linen, alcantara and more. No animal based materials or leathers are used and there are no precious metals or gemstones used, either, as these items are mined from Earth’s core. Additionally, every watch is assembled only when it is ordered and there is no secondary packaging. This eliminates the potential of over manufacturing and over stocking and eliminates waste. Watches are shipped using FSC-certified paper and cardboard. The new Baume brand offers the Iconic watch line (one of which is seen here) and a fully Custom Timepiece series. For the initial roll-out of the brand, there are two collections being launched. The first is called the Iconic series, which represents all of the brand’s philosophies. These watches are made in aluminium, feature 100 percent recycled PET (plastic resin and polyester) straps, and are powered by automatic movements. The watches retail starting at $560. The second collection is one that Baume refers to as a co-creation between the brand and the ultimate consumer. Called the Custom Timepiece Series, this line is made possible via an on-line configurator where the consumer can choose each of about 75 different watch components, including movement function, case material, strap material, hands, dials and more. The Custom Timepiece Series, as mentioned, offers a choice of either a 35mm or 41mm case of either aluminum or stainless steel. In the initial launch — which is officially today — several movement types — including three-hands, moonphase, and calendar with retrograde date– are offered. Straps in the Custom Timepiece Series are either PET or made from natural materials such as cork, linen, cotton or Alcantara. According to Baume, there are approximately 2,000 different permutations that can be made. 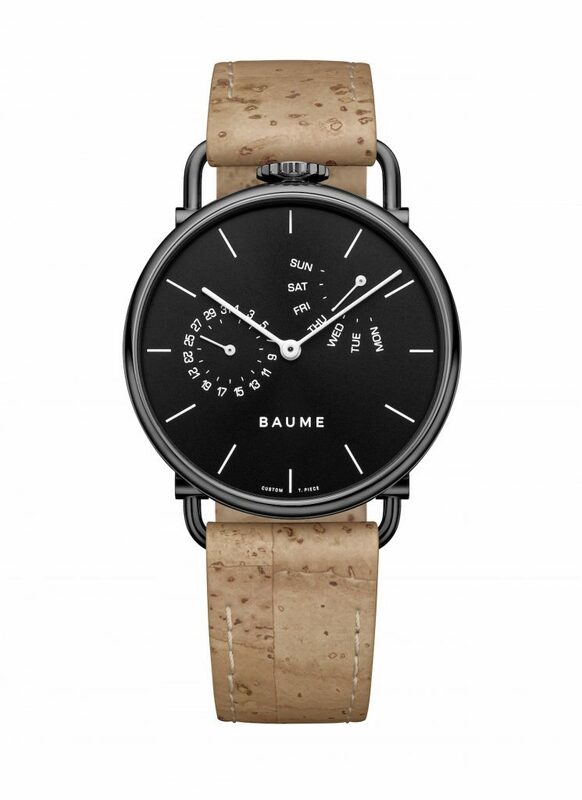 The Baume brand, new from Richemont Group, uses sustainable materials, including cork for straps. The official launch of the brand takes place today in Malibu Beach, California, where, for the unveiling of the concept, Baume partners with Waste Free Oceans. Waste Free Oceans collects plastics from the world’s oceans and recycles it. In this case, Baume will use the recycled plastics that will be collected this summer in the Azures, to make up-cycled watch straps. Additionally, a portion of the proceeds of the sales of Baume watches will be donated to the Waste Free Oceans organization. Baume is also helping the environmental agency with a re-branding of logo and other communications tools to position it as a more lively, cool organization that people can relate to and support. Visitors partaking in the launch of the brand today are helping to pick up plastics on Malibu Beach. According to Chassot, there will be many more partnerships moving forward. Baume Custom Timepiece Series watch with Alcantara strap. Initially the largest marketing efforts are focused on the USA and Europe because these countries are highly e-commerce friendly, but with e-commerce, Baume can easily be sold in hundreds of countries around the world. White the brand will not have a traditional marketing campaign, a creative social media campaign begins today. There are two focuses for this campaign: “Making Time,” which makes reference to making time for what matters, and also to designing your own watch; and “Designing for a better tomorrow,” which focuses more clearly on the brand’s vision. Baume’s e-commerce site is official open as of today. 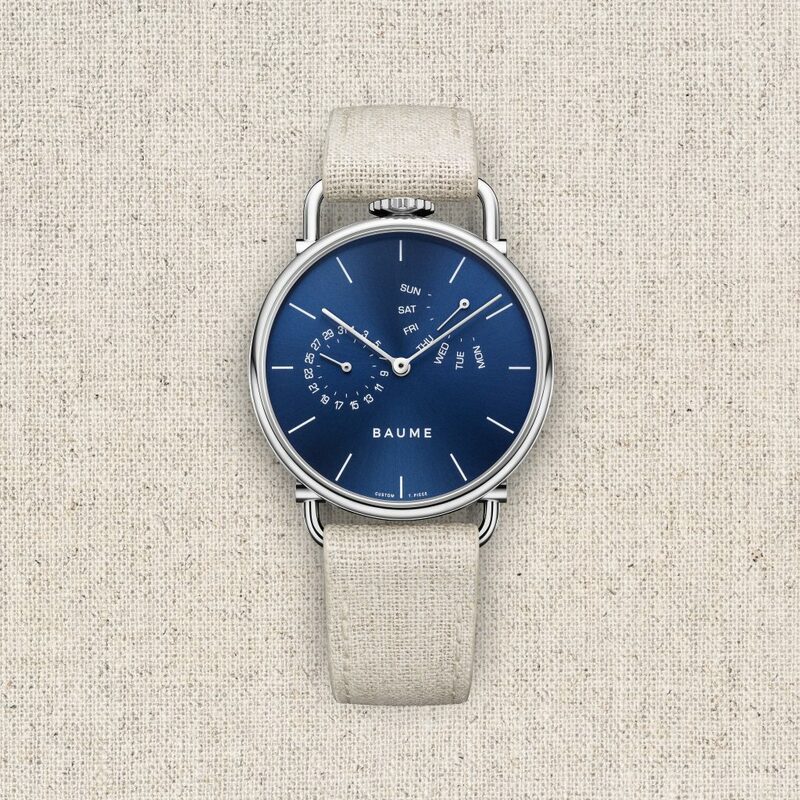 The Baume brand was nearly two years in the making from concept to fruition today. It is named Baume because it started under the umbrella of Baume & Mercier. In fact, Chassot was working for Baume & Mercier in product development and was instrumental in developing the concept. (Prior to her time at Baume & Mercier she also worked in product development for sister brand Roger Dubuis). At Baume & Mercier three years ago, she was the person who sought out and brought to market the sustainably sourced trout skin straps that graced the unveiling that year of the Petite Promesse collection. Chassot gives credit for the Baume brand coming to fruition to Alain Zimmermann, former CEO of Baume & Mercier (who has taken a position as head of the new E-commerce division of the Richemont Group), who championed the concept and facilitated it with Richemont. The Baume configurator lets customers select about 75 different watch components. 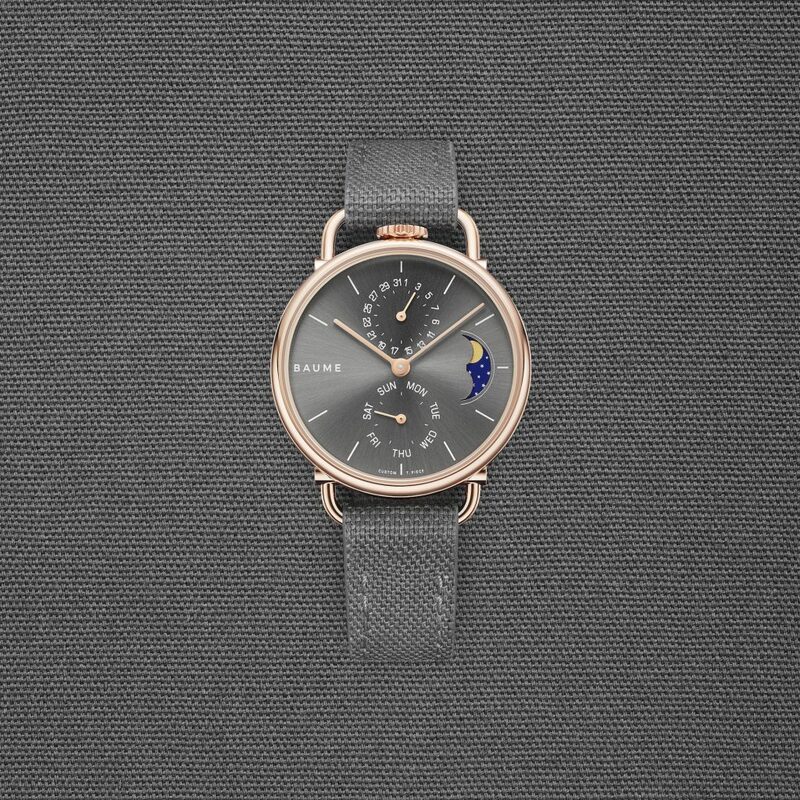 While the initial watches from Baume look interesting and do seem to be “genderless,” we wonder if the customer of today will accept a new brand with the name Baume. Maybe Richemont should have drawn a cleaner line and developed an all-new name that is, or could be, more relevant to today’s environmentally conscious consumers. The naming also leads us to wonder if Baume could be the undoing of Baume & Mercier to some degree. Baume has prices ranging from $560 to about $1,000. Baume & Mercier has prices starting at just under $1,000 and watches that look darn nice and have a lot to offer. Is it the right time for a sustainable timepiece? Of course, any time is the right time. I remember about 20 years ago Citizen Watch Company of America tried to launch a sustainable watch collection. Called Life, the watches were also made of aluminium, featured natural material for straps, and were packaged in cardboard. The world wasn’t ready for it. Perhaps today, the world will embrace the concept more whole heartedly and Baume will flourish. Can a brand exist solely via e-commerce? We think so, we are seeing it more and more with small independent young brands. The idea of assembling on order is an interesting one. Is it to eliminate waste or is it to eliminate over stock if the brand fails? Yes, there are many questions still to be answered about the Baume line. We hope to go hands-on with a Baume watch, wear it for a few weeks and review it in total honesty very soon. We also hope to try out the configurator. I, for one, am anxious to really consider the environment during the creation process and look forward to seeing the ensuing offerings. I also think Baume deserves kudos for partnering with different NGO’s as it moves along this interesting journey. Baume Icon watch line has two size case offerings: 35mm and 41 mm and two different movements, including this one with 24-hour indication and retrograde minutes. For more information on the Baume brand, feel free to visit my Perfect Timing column on Forbes.com.